In the late 1800’s and early 1900’s, waves of Italian immigrants brought many old world traditions to America. The traditional Italian bakery is perhaps one of the best-loved of all. Italian-American bakeries were originally founded to satisfy fellow immigrants’ desire for the delicious, intricate pastries and cookies of home. Now, as then, they are known for their wide variety of expertly fresh-baked cookies that can only be created and purchased there. Traditional Italian cookies come from centuries-old family recipes, and making them is a highly labor-intensive process. Extreme individual attention to detail is given to hand-crafting cookies that can be as small as a quarter, and hours are spent giving them own unique flourishes. Known as the crown jewels of Italian treats, cookies figure prominently in many Italian celebrations. Weddings often feature a dessert table with large displays of various cookies. Special types of Italian cookies are also prepared for traditional Italian occasions including Christmas and Easter, as well as on feast days like Carnevale, and the feasts of San Guiseppe and San Giovanni. There is an incredible variety of cookies originating from all different parts of Italy. Many are almond-flavored, as almonds are a bountiful crop in Italy. Their differences often lie in their flavorings with the fruits and nuts indigenous to their specific area. Here are a few of our popular selections, with descriptions of their origins and preparation methods. Our gluten-free Amaretti Pignoli is an almond-flavored macaroon cookie topped with pine nuts, or “pignoli” in Italian. Moist and rich, pignoli are made without flour, with almond paste and egg whites used instead. They are typically shaped in crescents or rounds. Pignoli originated in Sicily, and are popular throughout southern Italy, Catalonia, and Sicilian communities in the United States. They are considered to be a special luxury, traditionally served during Christmas and All Saints Day. Our Chocolate Covered Almond Biscotti is a crunchy dipping cookie, filled with crushed almonds half dipped in chocolate. Biscotti means “twiced-baked”, with “bis” being the Italian word for “twice” and “cotto” coming from the Italian for “cooked” Biscotti are the most popular Italian cookie throughout the world. Our dough is first shaped into loaves, then baked until golden brown, after which it is sliced and baked again. The dry texture of biscotti makes them ideal for dipping and soaking up coffees, teas or milk. Our gluten-free Brutti Ma Buoni are meringue cookies loaded with crunchy ground nuts. In Italian, “Brutti ma Buoni” means “Ugly But Good”. Despite their lumpy, misshapen appearance, these cookies’ crispy outside and chewy insides make them heavenly in taste. They are prepared from thick, rapidly whisked meringue, filled with chopped nuts. Brutti ma Buoni are said to have been created in 1878 by Constantino Veniani in Gavirate, a small northern Italian town just outside Milan. Our crispy Sprinkle Butter Cookies are light and not too sweet, with most of their sugar flavor coming from the sprinkles on top. They’re made from a simple dough of butter, sugar and flour, loaded into a pastry bag and piped onto baking sheets in the shape of a circle. The cookie of childhood, butter cookies are common in the southern Italian region of Calabria and are a staple of Italian bakeries everywhere. Our torcetti cookies are twisted, crispy pastry strips dipped in raw sugar. They have a soft, bread-like texture on the inside with a crunchy exterior and tempting caramelized bottom. Torcetti means “twists” in Italian. These cookies come to us from the town of Saint Vincent in Valle d’Aosta in North-Western Italy. Torcetti are thought to have descended from breadsticks. According to legend, a long-ago baker had some leftover butter and decided to add it to his final batch of his breadstick dough for the day. To be able to tell these “breadsticks” from the others, he rolled them in sugar and twisted them, and Torcetti cookies were born. 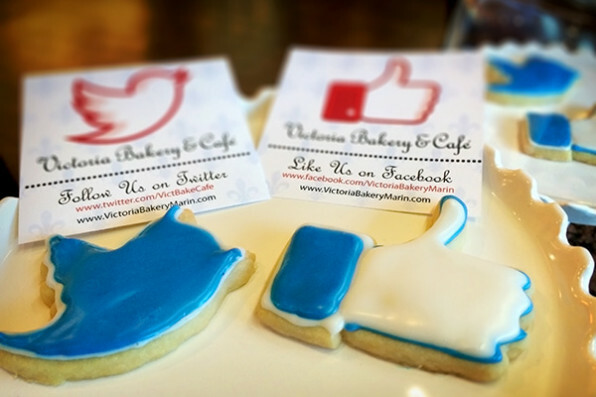 At Victoria Bakery and Café, we’re proud to prepare several varieties of authentic, regionally popular Italian cookies. We invite you to try the ones described here and many more. Come in soon and enjoy a sweet, delicious taste of old world Italy. Or place your order online.